I tried to befriend the mice, asked for peace! They have taught me so much… now it is our time to teach them. Carve a notch into the shelter spear for every kill… but be cautious. There seems to be an endless horde of Persian mice, but in this corridor, their number counts for nothing. I think the last part is a quote from the movie 300 but I never saw it. I was woken up early this morning by Chris exclaiming about the beauty of the sunrise, which we could see right from the shelter. It was gorgeous but I don’t generally want to get up at 6am. Everyone else was up immediately but I laid around while they all packed up and left then played my mandolin for a bit before finally packing up myself and going. It was a sunny and very warm morning, and the AT coincided with the Virginia Creeper Trail for a bit again, which was a nice, flat walk. We skipped eating lunch at the shelter because there was supposed to be a picnic area at the next road but it turned out to not exist. We stopped at the next campsite for lunch instead and dragged our heels about getting started up the mountain since it was so hot. I started up Whitetop Mountain once the sun was hidden behind some clouds and I was pretty much going up a never ending switchback. I felt like I must have at least circled the mountain once it was so long. Stretch caught up and we could see rain off in the distance and started to hope some of it would come our way to cool us off and drive away the humidity. Our prayers were answered very suddenly when lightning struck about 100 feet to our right. We were on a ridge with nowhere to go so we put on rain gear and kept going up. It turned out we were about 10 minutes from the bald, which is not the best place to be during a storm. We decided to run across since we could see Buzzard Rock from where we were. The storm suddenly intensified though so we stopped between some short trees to strategize. We decided to drop our packs and trekking poles there and run back down the hill to crouch between some boulders near some short trees. It was pretty uncomfortable but I thought it was fun. The storm was moving quickly and we stayed there until there was about 15 seconds between lightning and thunder and the sky was blue and sunny above us. There was a strong wind blowing now, which helped move the storm along, and suddenly we had amazing views in every direction. We took a few photos but still moved along quickly. Turned out there was still half a mile of bald left after Buzzard Rock so it was a good thing we didn’t run for it. We skipped the side trail to the summit and got back in the trees. 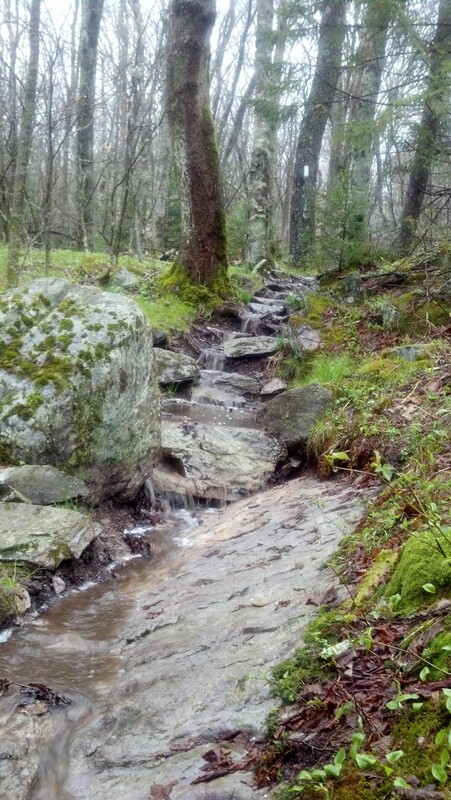 From this point on for the rest of the day, the trail was indistinguishable from a creek bed. Water was flowing deep and unavoidable. My rain gear had just about dried off and then it started raining again. We reached another bald area and were almost across it when lightning struck again, this time on a power line we had just passed. We ran across to the forest that was close by and saw some people camped out. It was pouring and we were already soaked and we didn’t want to set up tents in that weather so we crouched in some short evergreens amidst the taller trees for a while again. It didn’t stop raining but eventually we hadn’t heard any thunder or seen any lightning in a while so we decided to move on to the shelter so we could at least be dry for the night. Shortly afterwards we saw a bag of what looked like candy on the ground and thought it might be trail magic. It definitely was not magic, but had fallen out of someone’s pocket because it was half trash and had a pipe in there too. I took some Jolly Ranchers though and Stretch took a Snickers. A minute later I almost doubled over laughing when it occurred to me that at no other point in my life would I pick up a bag of trash off the ground, eat out of it, and be super happy about it. But whatever, that trash candy was delicious. I guess my transition to hiker trash is complete. We ran into Bass a minute later. He had set up a tent before the storm and came out when he heard us giggling down the trail. Talking to someone who is perfectly dry when you are soaked is annoying. We told him we didn’t associate with dry people and continued splashing down the trail. We still had several miles to go of our total 18.7 but it had stopped raining for the most part and was relatively easy hiking besides all the water on the trail. At one point I swear I heard growling in the trees to our left so that gave my lagging feet a boost. We finally got up Mount Rogers to the Thomas Knob Shelter just before dark. We skipped the side trail to the summit but intend to go back in the morning and check it out. Today reminded me of a bumper sticker in Miss Janet’s car: “The difference between an adventure and an ordeal is attitude.” Today probably doesn’t sound very fun but I had a blast! todays adventure did in deed sound very exciting..